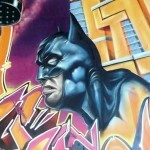 Graffiti is an under-appreciated art, and when pulled of correctly, it can really make the walls of a city come alive with meaning. After looking around the web for some creations here and there, we’ve decided we’d get our favorite pictures from here, there, and everywhere and make a nice post with all of them. 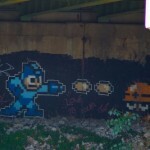 So, here we are now, enjoy these 22 Incredible Geeky Graffiti Pieces. Amongst the many other stories you might enjoy, we’d like to recommend Star Wars Dog Cosplay: Banthas, AT-AT And Tauntauns Galore! and Breaking Bad Bathing Salts: Meth Is Classy After All. Jules Winfeld and Vincent Vega are our favorite duo from any movie, and it’s great to see them making an appearance in this list. 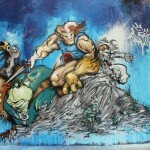 From the walls of Buenos Aires, an incredible Thundercats graffiti with a very unique style! Fans should be pleased! 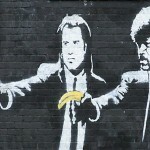 Yes, memes can be in graffiti, just like graffiti can turn into memes! 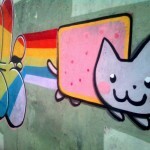 Isn’t Nyan Cat just the cutest? 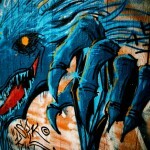 Is there anything in this world that can go wrong if you add a badass dragon to it? Well, I guess a peaceful village… but definitely, definitely not graffiti. Just seeing Totoro there is enough to send me through a singing fit and make me hum the catchy theme all night long. 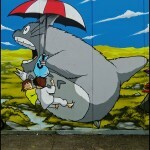 Why are you so awesome, Studio Ghibli? 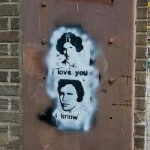 Our favorite Star Wars couple appears in the list! Aren’t they adorable? Here’s the bat, along with his nemesis, and would-be-lover, Catwoman. Meow, wow, bats. 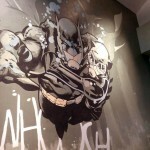 Another brilliant piece featuring Bruce Wayne’s alter ego. 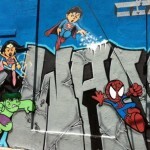 This is a stylish depiction of some of our favorite heroes of all time: we have child versions of the Hulk, Spider-man, Superman, and Wonder Woman. Where’s Batman, though? Here’s an unlikely entry on our list. 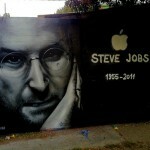 Steve Jobs passed away in 2011, and the world is a different place without him, but people still remember, hence, here’s a felt tribute to him made in graffiti style. We are not sure if this is the best entry on this list, but at least, it’s the one with the best placement. 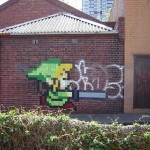 We had to go all the way to Melbourne, Australia to find a decent Link from The Legend of Zelda, but here he is, in all his Minish Cap glory! 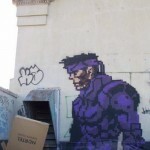 And just in case Capcom isn’t really your favorite company, here’s some art featuring Konami’s most well known character, Solid Snake from Metal Gear Solid. We’re sorry for Resident Evil or Devil May Cry fans, but Megaman is Capcom’s real, quintessential franchise, and as such, the one most deserving of an entry in this spot. Another piece featuring Lord Vader. 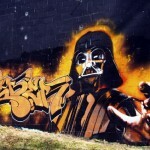 This piece is pretty good, and all, but it just really makes us wish Vader had a hip-hop album out. 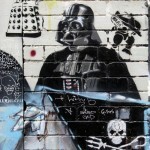 Lord Vader makes an appearence in our list with this one piece, looking as badass and fierce as ever. 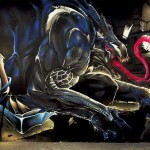 English speaking countries are not the only ones that have incredible graffiti pieces around, as this Venom one from Belgium shows. 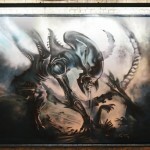 This one features the Xenomorph, from the classic Alien movies, and can be seen in East London. 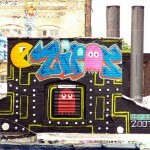 Pac-man is beloved by geeks, gamers and casual players everywhere. 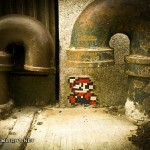 It’s not surprising to see him appearing in some walls, as in this case, in the walls of Brooklyn, New York.